Porky Mozzarella Sticks Pork Rind Recipe: Four easy ingredients make these Porky Mozzarella Sticks a go-to. Grab some string cheese and a bag of Rudolph’s Pork Rinds for a snack we’ll dare to say is better than your favorite restaurant’s. Want to mix things up? Go for Bold and Spicy Rinds! Rudolph’s Sweet Delight Pork Rind Recipe: Don’t shy away from this quick app. You’ll reach for handful after handful once you get a taste of this Sweet Pork Rind Delight! 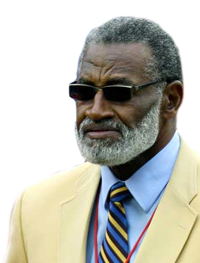 Whether it’s crunching running backs or crunching on his favorite snack, Hall of Famer Bobby Bell has always been a tenacious competitor. Now you can get into the action by playing a game especially designed for the rind lover in all of us. #PorkRindDay, on February 7 is the biggest day of the football season. And we’ll prove once more that pork rinds and football are a match made in heaven! 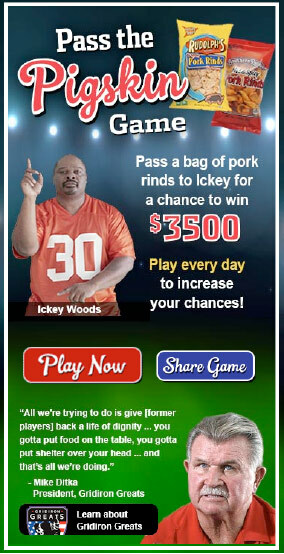 Play our Sack the Quarterback Game and you could be the lucky pork rind fan to win 3500 BIG ONES on the Big Game Day. Plus a year’s supply of – you guessed it – pork rinds. Between now and the Big Game, a portion of each purchase of all Rudolph Foods branded products, including Rudolph’s, Southern Recipe, Pepe’s Snacks and Lee’s Pig Skins, will support the Gridiron Greats Assistance Fund, up to $15,000! Trust us, this is the most delicious way to give back! Find us on Facebook or Twitter to let us know how much you love our new game. This football season, we’re doing it right. Pork Rind Appreciation Day is just around the corner. Just by playing our new Sack the Quarterback game, you could win $3,500 and a year’s worth of pork rinds. And we’ve got all the best tips so that you can homegate the right way. Did you know that 70% of football fans would rather get together with friends at home to enjoy the game than actually go to the game? Go to the grocery store a few days ahead of time so that game day is just about great football, great friends and great times. Keep guests full and focused on the game with plenty of party snacks. Our Yummy Onion Rings and Luau Pig Poppers are sure to be a touchdown. Use disposable plates, cups, and silverware so you don’t have to worry about dirty dishes during or after the party! This way, you can host your homegate and enjoy it too! Use your slow cooker to keep dips, like our Charro Beans, warm during the event. Simple! So, who will you be cheering for this weekend? Share your favorite football team with us on Facebook or Twitter with #RudolphsFan and you could win a signed football with Coach Ditka’s signature! Play for a chance to Win $3500 and a year’s supply of pork rinds! We’re counting down to Pork Rind Appreciation Day on February 7 with fellow pork rind lover and Hall of Famer, Bobby Bell. 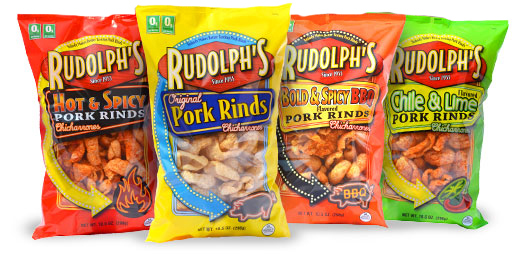 Have you played to win $3,500 and a year’s worth of Rudolph’s pork rinds yet? Come back everyday to play our Sack the Quarterback and you could be the lucky rind fan to win BIG on the Big Game Day. Between now and the big game, a portion of each purchase of all Rudolph Foods branded products, including Rudolph’s, Southern Recipe, Pepe’s Snacks and Lee’s Pig Skins, will support the Gridiron Greats Assistance Fund, Inc. up to $15,000! This nonprofit organization that provides medical and financial assistance to former National Football League (NFL) players in dire need is one we’re fans of … and you should be too! Buy rinds. Give back. Play. Repeat! Find us on Facebook or Twitter to let us know how much you love our new game! Do you hear it? The crunch heard ’round the world in appreciation of the best tasting pork rind snack around! Pork Rind Appreciation Day is right around the corner. It’s so close you can almost taste it! Imagine this: It’s finally February 1st. Pork Rind Appreciation Day and, oh yeah, the Big Game too! You’re clutching a shiny bag of Rudolph’s Pork Rinds in your hands and you can see those tasty, salty bites of pigskin just waiting to be devoured. You open the bag and the next thing you know … you’re in pork rind heaven. Don’t forget to play Pass the Pigskin with former NFL player Ickey Woods and Coach Ditka. 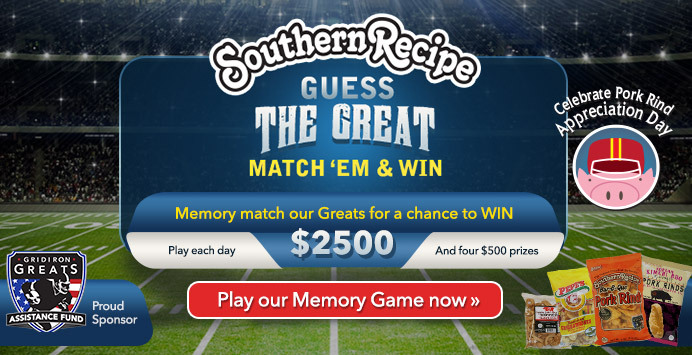 Last chance to enter to WIN $3,500 and FREE pork rinds for a year! Hurry, time’s almost up to play and win! Win $3,500 and a Year’s Worth of Pork Rinds! Celebrate Pork Rind Appreciation Day by playing Pass the Pigskin Game with Ickey Woods & Coach Ditka and you could WIN $3,500 and a year’s worth of Rudolph’s Pork Rinds! Each day you play or share our game with a friend, you’ll be automatically entered to WIN! 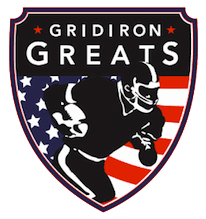 And as an added bonus, with each store or online purchase of Rudolph’s, Southern Recipe, Pepe’s and Lee’s snacks, we’ll make a donation to Coach Mike Ditka’s Gridiron Greats – a non profit organization whose mission is to support former NFL players in dire need of medical and financial assistance. What are you waiting for? Play now … and play every day to increase your odds of winning! Tailgating … With a Pork Rind Crunch! It’s estimated that 50 million Americans are proud to call themselves tailgaters. That’s a whole lot of fans in need of food to fuel up for gameday! We’re here to make sure you don’t fumble with your snacking lineup. Is it just coincidence that you eat pig skin while watching the ol’ pigskin being tossed around? At Rudolph’s, we think not! Just in time for the peak of tailgate season, we huddled up to share this list of tailgate trivia sure to get you pumped up for the big game. • 35% of tailgaters are so dedicated to pregame events that they never even enter the stadium. • 40% of tailgaters start their festivities 5 hours before kickoff and tailgate 6-10 times per season. • According to a study by the PR Newswire, the best tailgating cities are Baltimore, Denver, Houston, San Diego and Cincinnati. • 95% of tailgaters actually prepare food at the stadium. • It’s not uncommon to eat over 3,000 calories at a tailgate, but did you know that pork rinds are a healthier way to add crunch and flavor to your favorite bites? A serving of pork rinds have 0 grams of carbs, 9 grams of protein and only 5 grams of fat. Check out these pork rind recipes you can make with Rudolph’s Pork Rinds for your next parking lot party … or living room celebration.